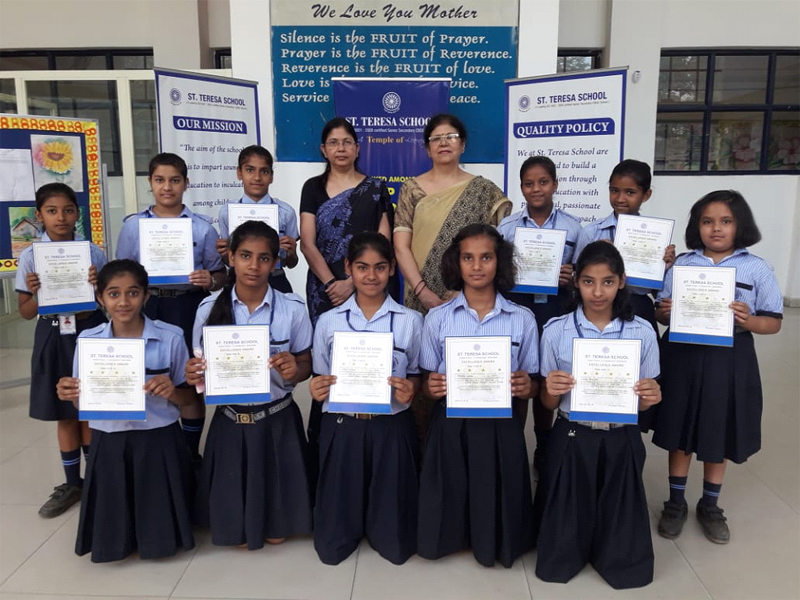 Therefore to celebrate Earth Day and to showcase our support for a safer and greener future, Team St. Teresa held a Special Assembly on this occasion. A skit highlighting the environmental issues to sensitize the students was staged. The students took a pledge to safeguard the environment as no generation has a freehold to this earth; all we have is a life tenancy with a full repairing lease. The assembly concluded with a noble gesture of watering saplings by the Academic Director, Head Mistress and Coordinators of school to show their commitment and support for sustainability of environment and our future generation. 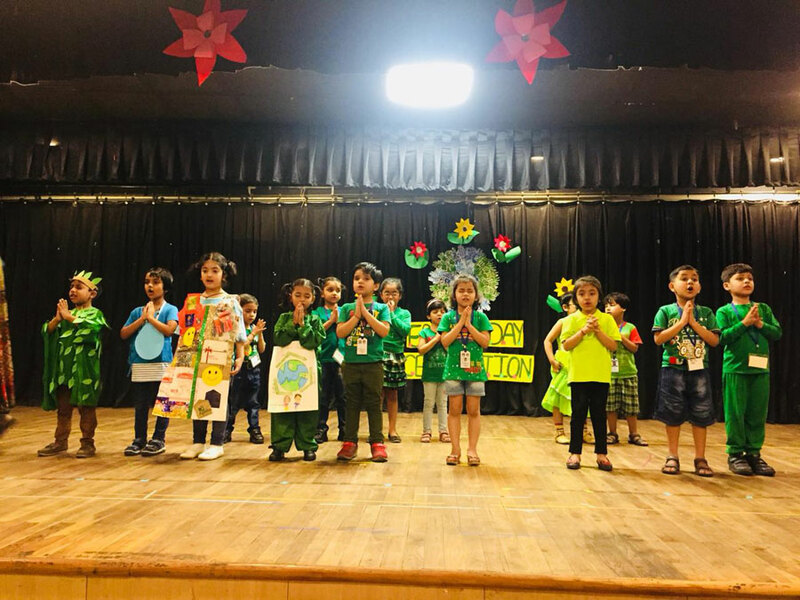 Annual function of school centered round the idea of depicting changes experienced by time in varied themes summing up with a positive note of greener and happier world for posterity. Sri Ranbir Singh, RO CBSE Dehradun, presided as chief guest of the event accompanied by guest of honor Sri Bachchu. Singh registrar Gautam Buddha university. In his welcome speech Director Sri R.R. Khanna enunciated progress of school in academics, literary and sports during academic session 2018-19.”Teachers are the pillars of our institution and it is their hard work, devotion and dedication that we are able to come out with 100 % class X and XII board results.” stated Director R.R. Khanna. 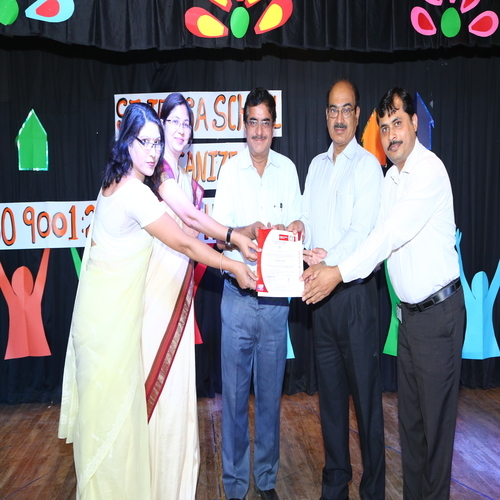 “KAALCHAKRA” theme based event was formally initiated following the Annual report of the school. 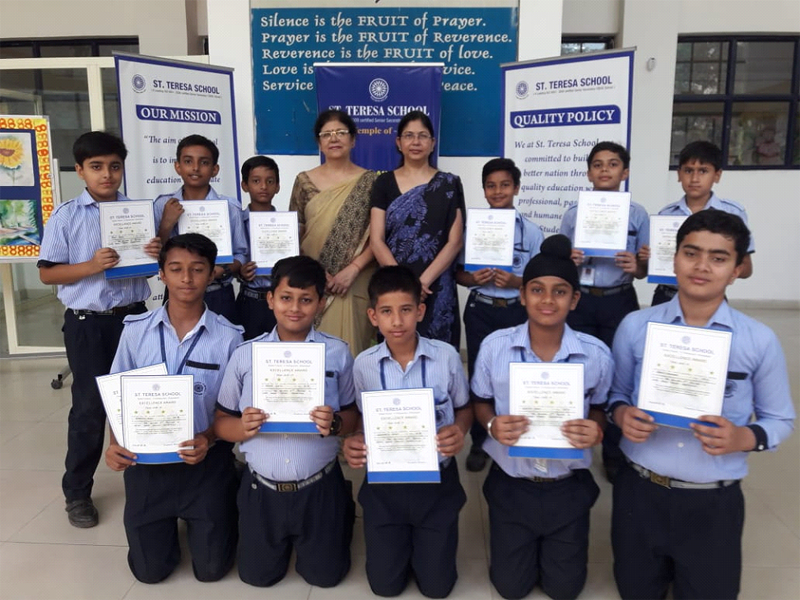 It was a moment of pride when chief guest RO CBSE Dehradun Sri Ranbir Singh addressed the gathering and appreciated the efforts made by team of ST. Teresa School. He made an appeal to make the female child stronger. Hours long cultural program was amalgamation of changes witnessed by time in various spheres consisting variety of dances, skit, mimes and musical presentations. Towards the end of the event participants were encouraged by words of appreciation of Director Sri Vijay Kumar Gulati. Programme concluded with musical performances by music department and vote of thanks by Academic Director Ms. Renu Srivastava mam. The event sensitized the students and the audience about the social and environmental concerns. An Open Skating Championship competition was held on 21st August , 2018 at Chilla Sports Complex Vasundhara enclave . This skating tournament was by organised by CK Tedant Sports Foundation. 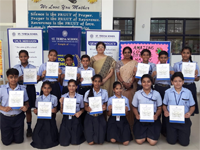 Students from various school participated in it.The students of St. Teresa School acclaimed glories for the school with their outstanding performance. 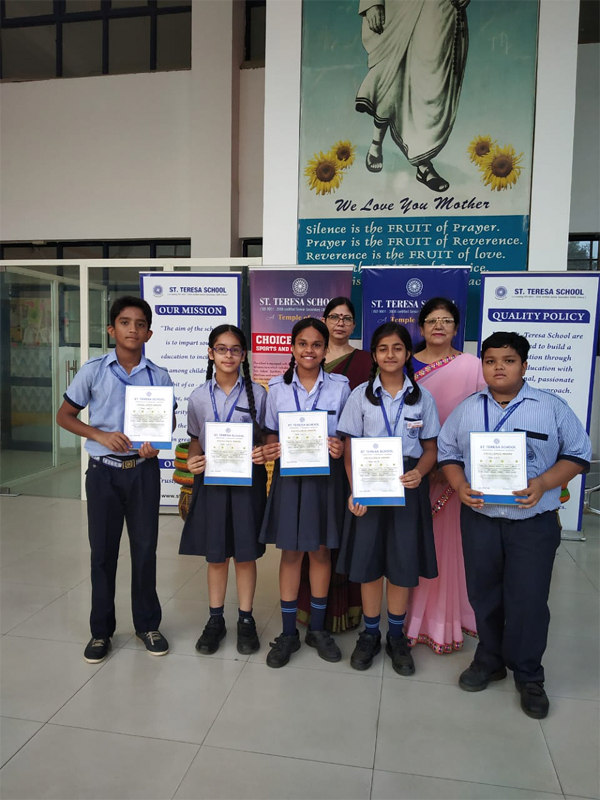 5 students achieved the first position , 4 students achieved the second position and 4 students attained the third position to n different categories. 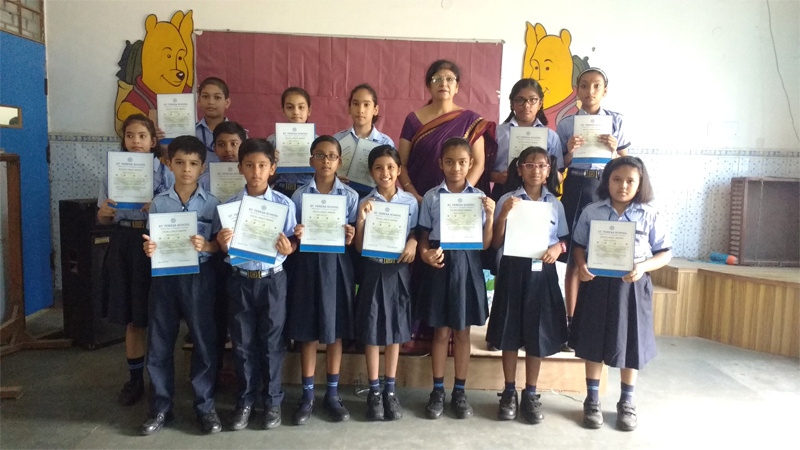 All the winners were fecilitated with medals and certificates for their performance. An educational trip to the National Zoological Park was organized for the students of class I on 6th Oct 2018. The children embarked on the journey to the zoo on a peppy and excited note. 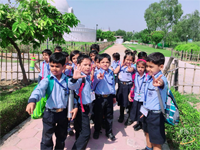 The students enthusiastically spotted the majestic animals and birds like Asiatic Lion, White Tiger, Royal Bengal tiger, ostrich, pelicans and elephants basking in the winter morning sun. They had a wonderful time watching giraffes, tigers, jaguars, elephants, migratory birds and much more. The ‘Joy Ride’ in the battery operated trolleys brought about squeals of laughter and joy. The National Zoological Park has more than 2000 species of birds and animals living in an environment that in many ways resembles their natural habitat. Children learnt a lot about the animal kingdom and their importance. Overall it was a day well spent which gave our tiny tots wonderful memories to cherish forever. Role playing is one of the most important tool of learning. Keeping this in mind a Fancy Dress Competition was organized for the children of class1. 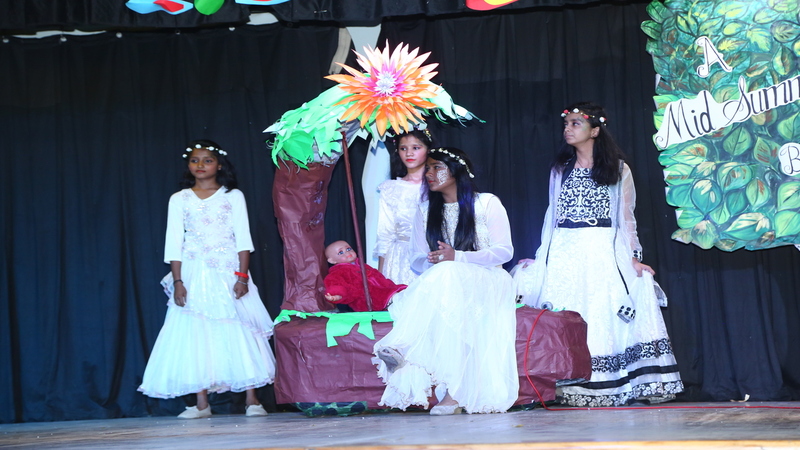 The theme of the competition was,"Dolls Of India". 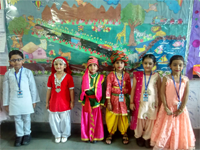 The Nursery sections of St. Teresa School celebrated the blue day celebration on 14-08-18 .It was pleasant and light day for tiny tots.All the children came in different shades of blue colour.Each class recited rhymes on stage one by one.They were so happy. 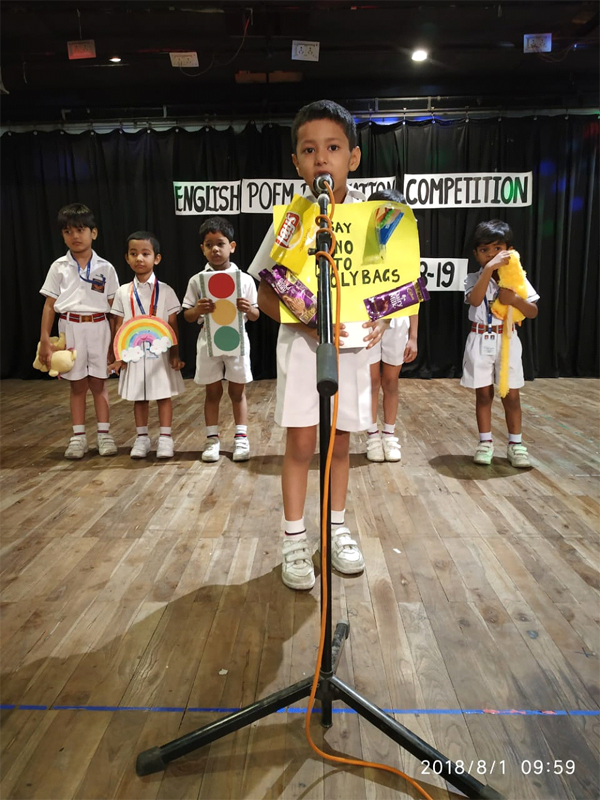 INTER HOUSE POEM RECITATION 2018-19. Words make you think. Music make you feel. A song makes you feel a thought. 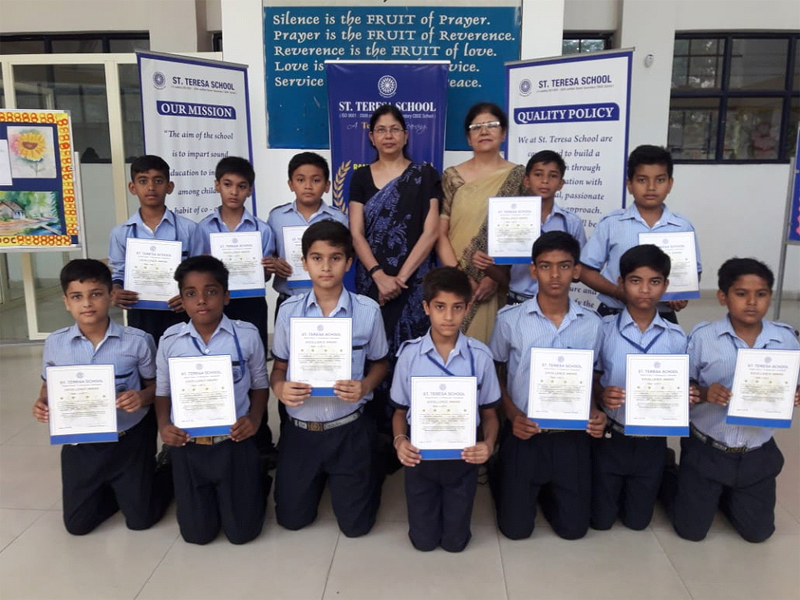 Owing this in mind, our school organized an Inter – House Solo Singing Competition for students of Class Vi to VII on 27 th April, 2018. The theme for the competition was bhajans or sufi song. 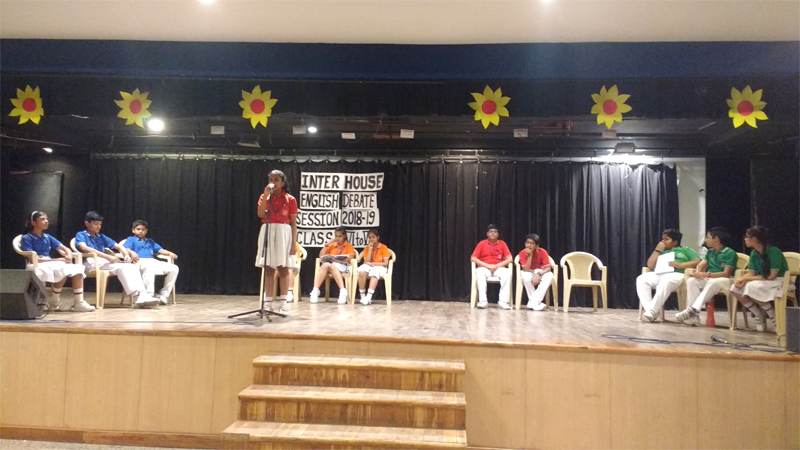 During the audition each house selected one student each from Class VI, VII and VIII to represent in the finals. 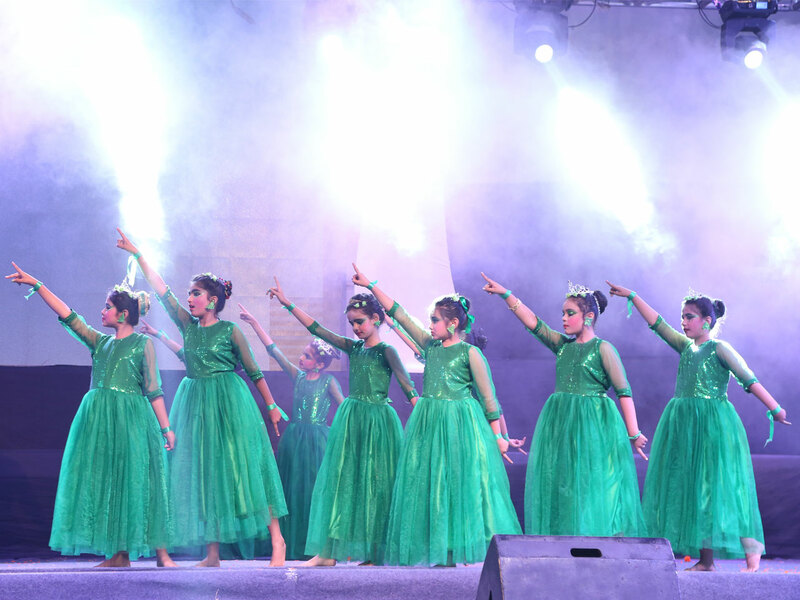 All the participants put forth their enthralling performance singing melodiously which mesmerized the audience. The audience supported and appreciated the participants with roar of applause. Theme : "Life On Our Earth". 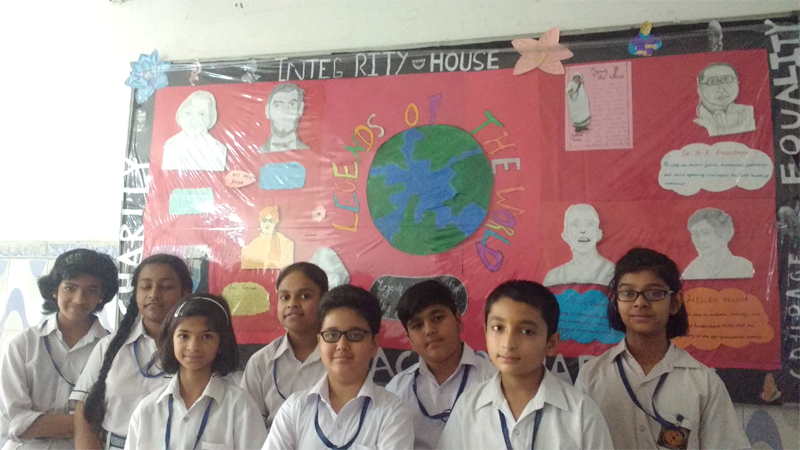 Inter house board decoration competition of classes 6 to 8 held on April month 2018. 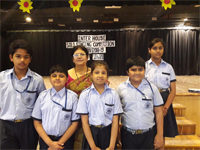 Inter house Solo singing competition held on 27april 2018 for classes 6 to 8. 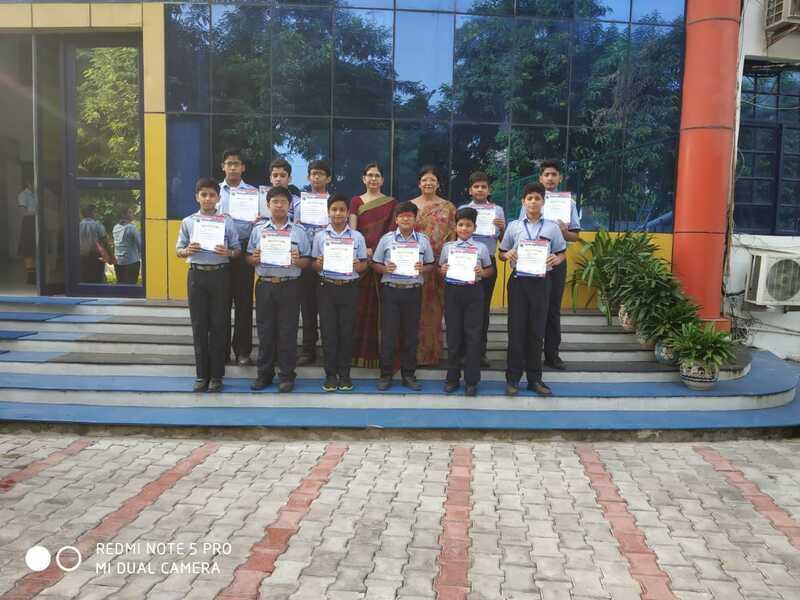 1st position bagged by Shikhar Pandey 8A , harmony House. 2nd position bagged by Aritra biswas 7B, charity house. c) Bhoomika Pandey,8E, charity house. Creativity is a way to look at things in a different way. 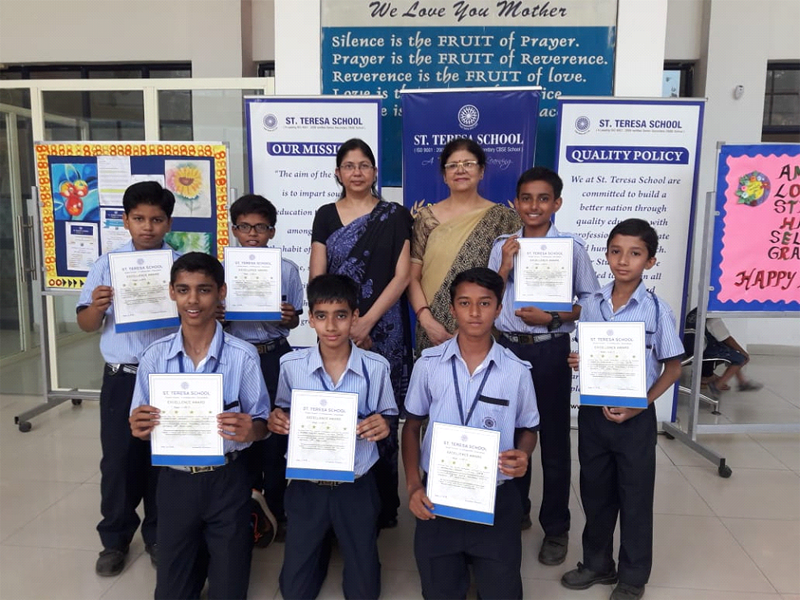 St. Teresa School organized Advertisement making Competition on 7 th May, 2018 for students of Class 6 to showcase their creativity. It comprised of humorous and conceptual ad presentation by students. 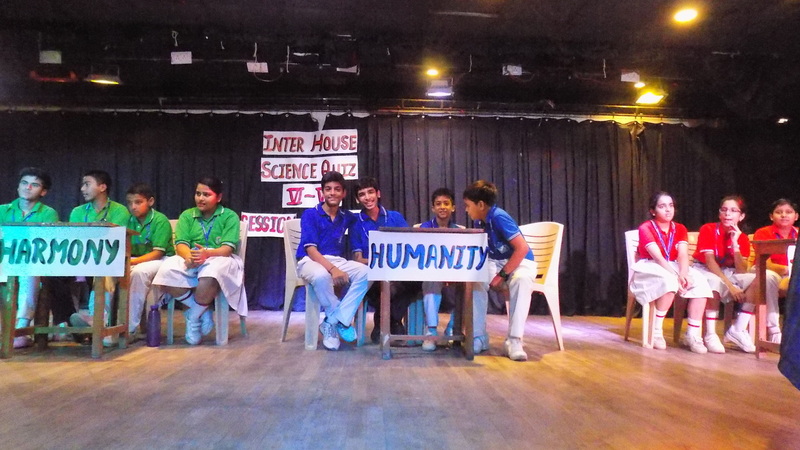 The students acted out on various advertisement scripts and ideas which were self composed. They performed with great enthusiasm and zeal and displayed their creativity and talent. Their spell –bound performance was applauded by the audience. “Without imagination, dreams and discovery, there is no point to life.” Nukkad Nattak competition is to challenge the existing ideas and beliefs in the society and bring about the changes. Our school gave an opportunity to the students to come up and convey their ideas on a social issue “Pani ki Samsiya “on 15 th May, 2018. 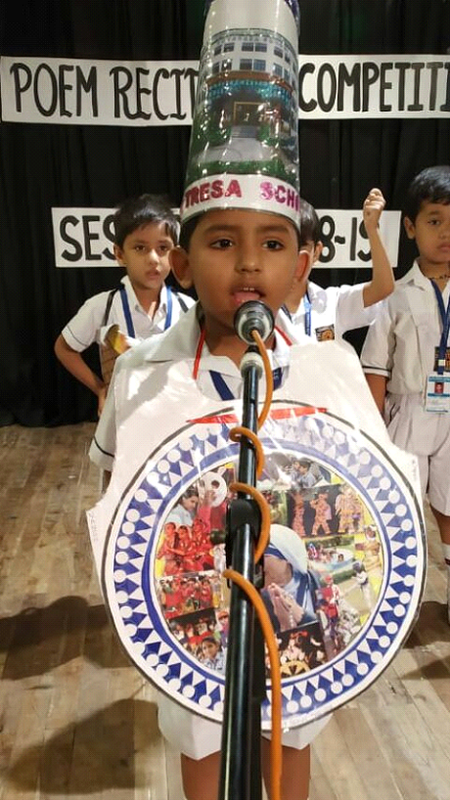 The student of Class VI to VII representing their house, captivated the audience with their loud voice and expression regarding water saving. No stage, no lights, no records, just loud talent. A highly energetic performance was given by each house expressing their ideologies of the change required in our life to save water. The venue was filled with applauding roar for outstanding performance of the participants. Study alone can’t fetch you the life skills. A pinch of little salt and pepper is necessary to sail through the difficulties of life. Sometime it’s good to be crazy. Cricket actually binds us as a nation . To bring that craziness out of students’ routine life an Inter House Cricket Competition was held on May 5 , 2018. The response among the participants was overwhelming . The huge number of students queued in the ground. Few of them shone like twinkling stars and slid through the pavilion , waiting for their turn for standing ovation . The competition was aptly able to improve children’s decision making capacity. Calligraphy is an art of writing beautifully. There is a famous saying: “Writing is the painting of the voice.” Writing is the primary basis of communication, history, record keeping and art. 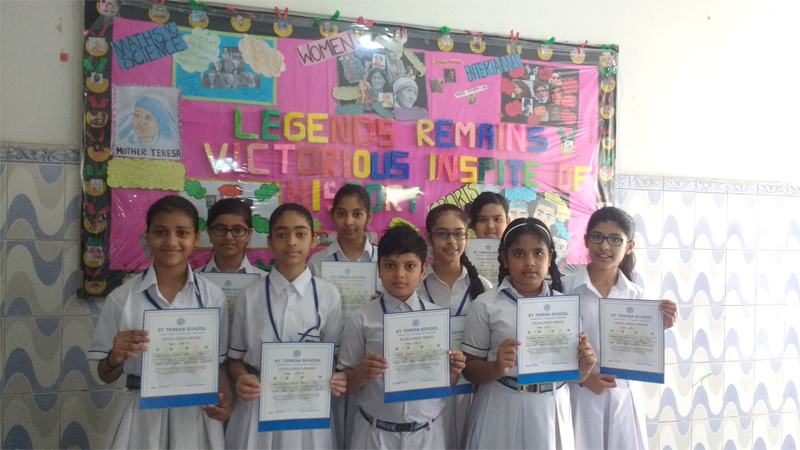 Keeping this mind, our school organized an Inter – House English Calligraphy Competition on 19 th April, 2018. 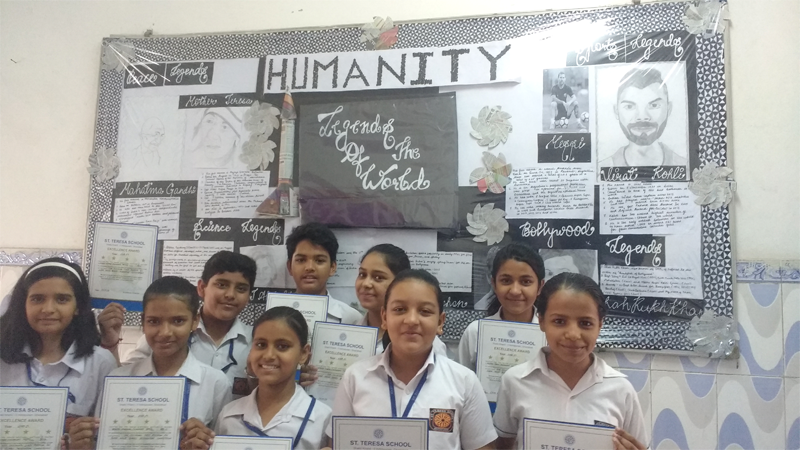 All students of Class VI to VIII participated in it. The competition was held in the respective classes. Students were given a passage to write in 30 minutes. 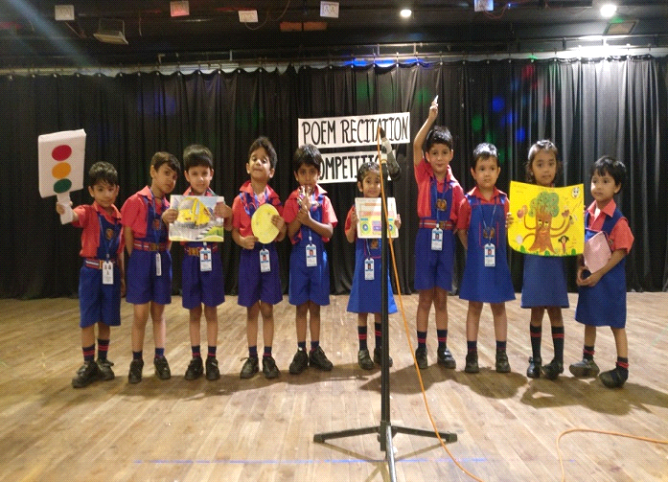 The aim was to encourage students to write neatly and present the content in proper manner, to complete the work within the given time, to make students aware of correct formation of letters and punctuation. 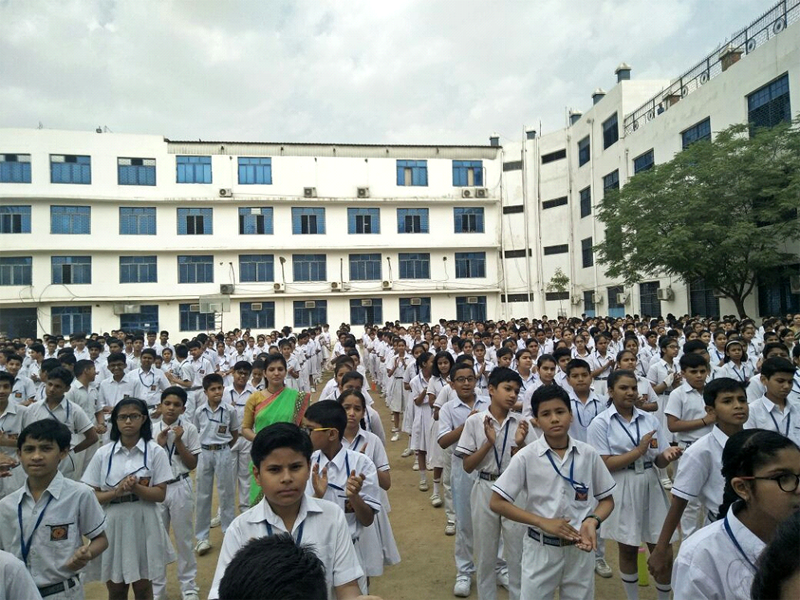 Our school conducted a special assembly on the occasion of ‘World Health Day’ on 5 th , 2018 to make students understand the importance of the day. On this day, the world leader’s pledge to ensure that everyone, everywhere can access essential quality health services without facing financial hardship. The students imparted this information through an informative speech and shared some interesting facts with the audience during the assembly. Raksha Bandhan is a special festival celebrating the chaste bond of love between a brother and a sister. To celebrate this emotional bonding , our school organized a special assembly where the student. Students shared their views on this special event and sang songs .Raklhi making competition was also organised in school premises , where students showcasted their talent and creativity. Please visit photo Gallery for pictures of the competition. Deabte is one of the academic activities that gives students creative room to express what they feel.The length and breadth of knowledge that they gain through this is simply unparalled. 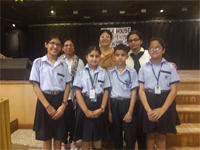 The topic of the debate "indian schools promote creativity in students" was enough to stir the thoughts of enthusiastic participants of different houses. 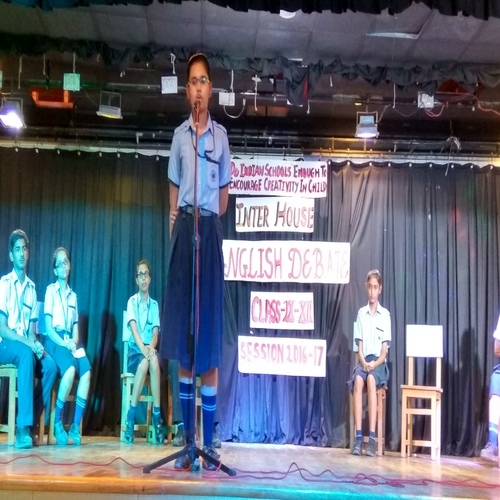 An Intter House English Play Competition was organized in the school auditorium. The event was presided by our Honorable Directors Mr R.R. Khanna and Mr V. Gulati. P.S. Please visit PHOTO GALLERY for pictures of the event. St teresa always believes to find out the hidden talent of the students and motivate them to achieve their goals. 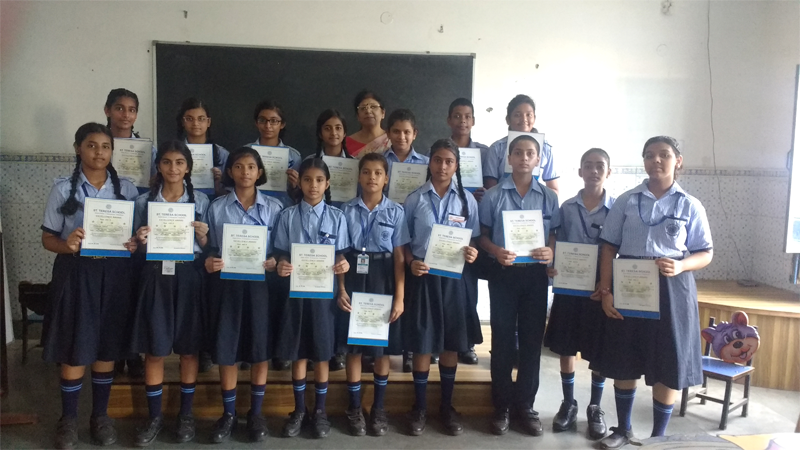 So to enhance their skills "Solo Dance" competition has been organized and students from VI-VIII showed great enthusiasum. To cool off the scorching Sun, we organized Splash Pool activity for children of Nursery & KG. Children just set themselves free in the water… and had a real feel of bathing in the beach. Creativity resides in every child. A right impetus is required to bring forth the innate qualities present in a young toddler. To make the little ones familiar with colour. 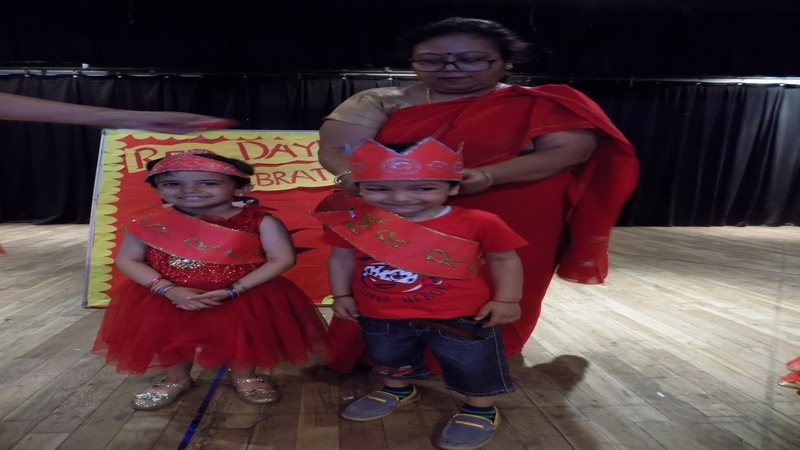 Students of nursery came wearing Red colour dress. 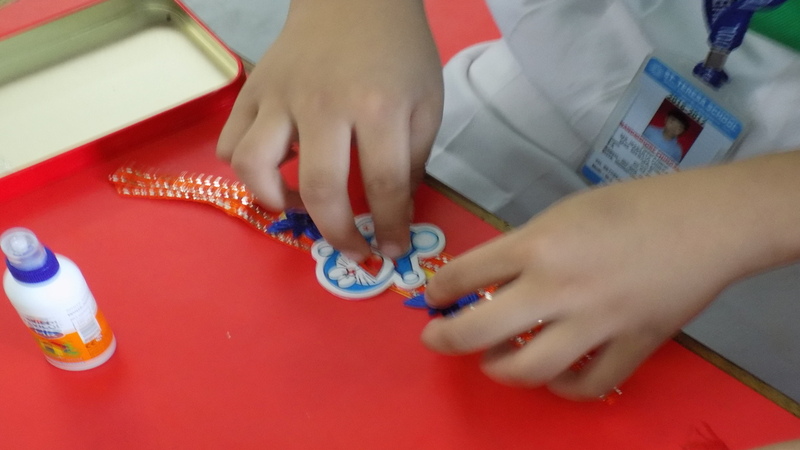 Each student put tag of different red colour fruit and vegetables. Children are awarded Miss Red and Mr. Red according to their performances. 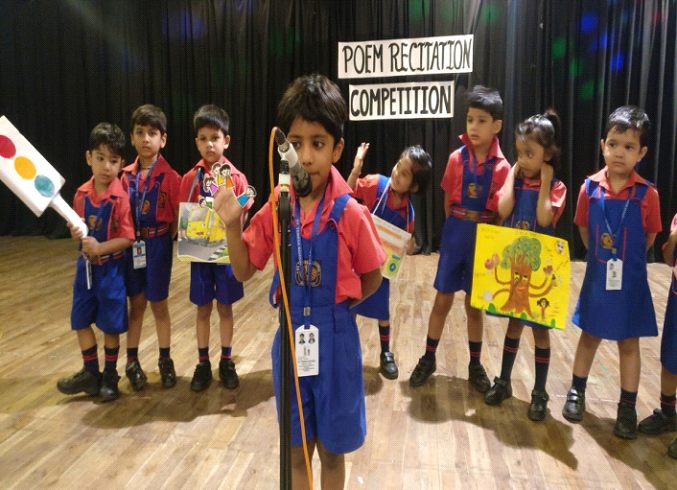 Children recited rhymes related to red colour object. Children did paper tearing activity conducted by filling red strawberry in their activity book. 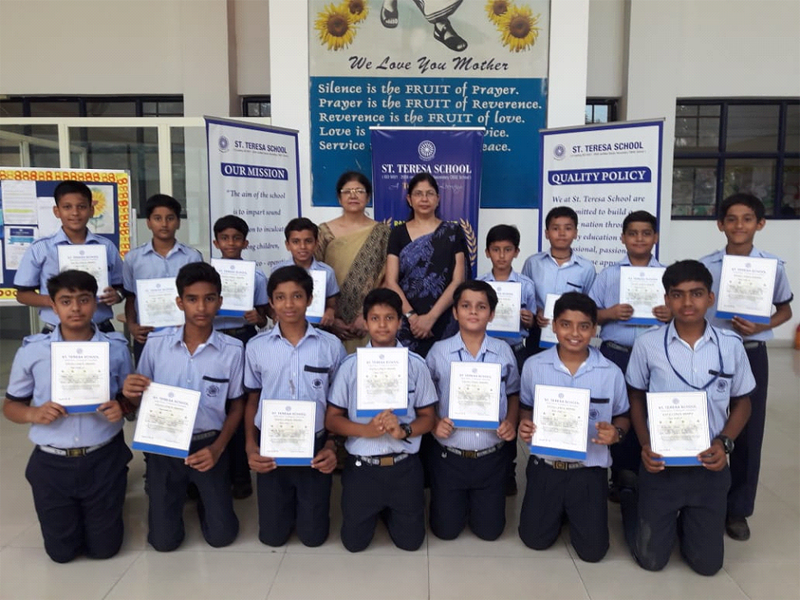 It was a proud moment for STS when ISO 9001:2008 certification was awarded to school by Mr Chander Shekhar Chauhan,Manager Certification North Zone India of Bereau Veritas Pvt Ltd. 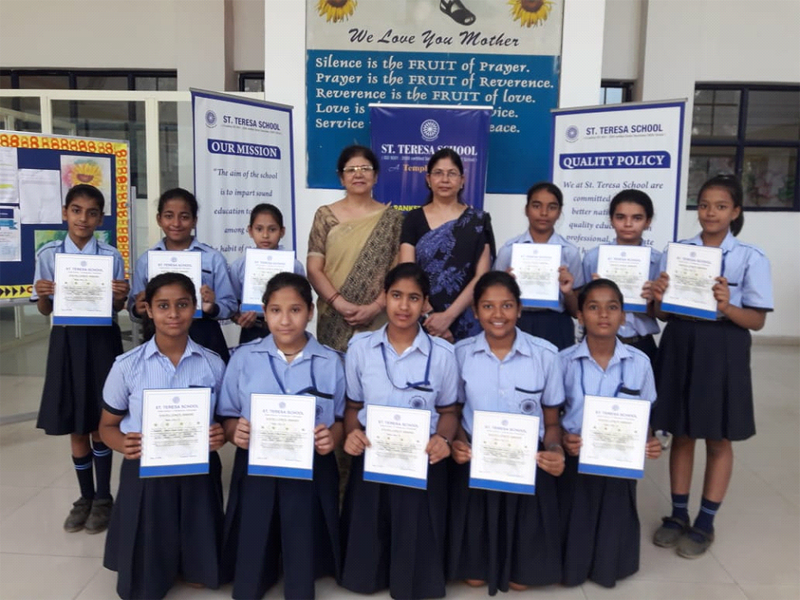 This certification is a testimony of the quality maintained by the school in every area -be it academics, discpline ,facilities or process.It was a very pride moment for STS Family. P.S. : Please Visit Photo Gallery for pictures of the event. 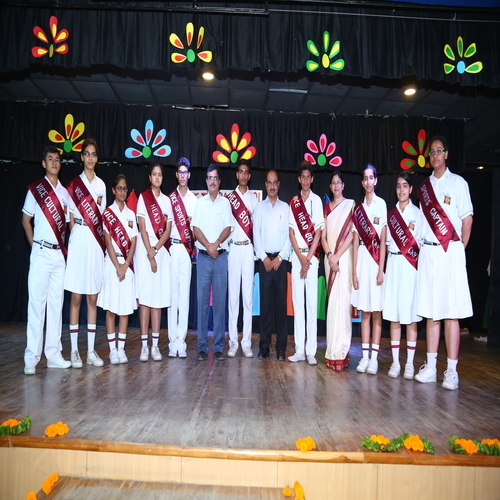 A Grand Investiture Ceremony for the Students Council at school Auditorium of St Teresa School, Indirapuram Ghaziabad. The Academic Director, Ms. Renu Srivastava extended a warm welcome to the distinguished gathering and emphasized on the true meaning and significance of leadership. 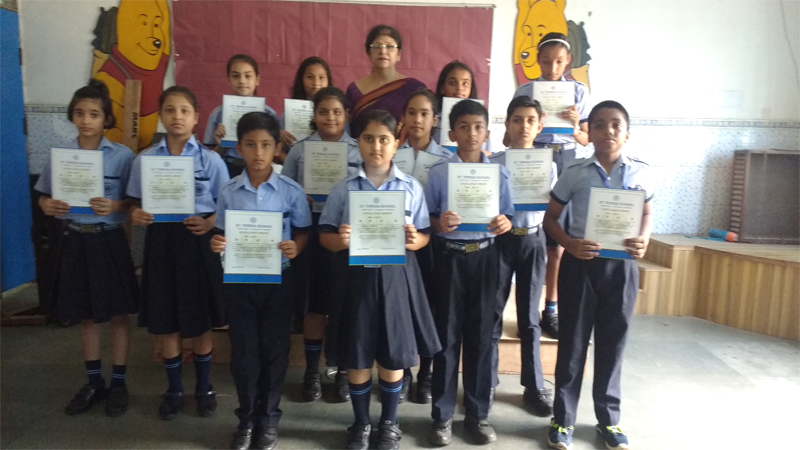 The newly appointed Students’ Council was administered the oath, and were given sashes & badges by Honorable Directors Mr R.R. Khanna,Mr Vijay Gulati & Academic Director Ms Renu Srivastava. 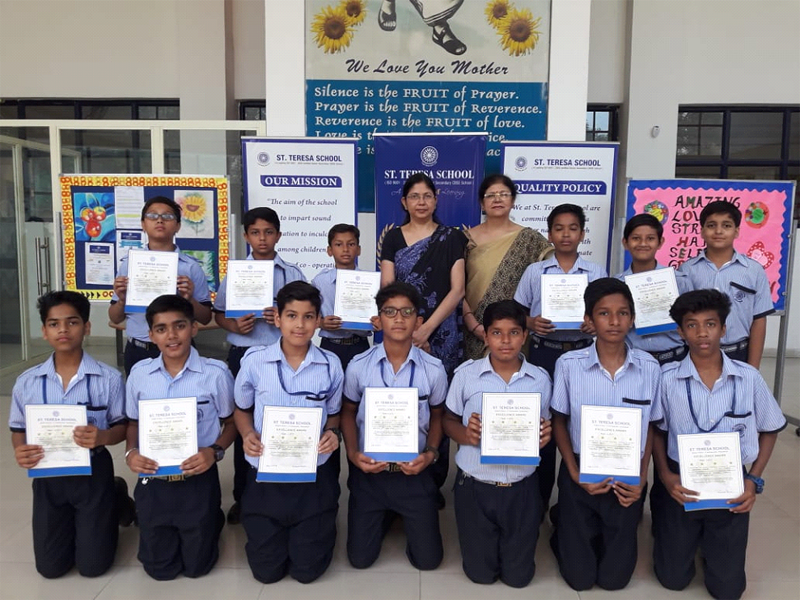 It was a proud moment for one and all when the members pledged to uphold the values of the school.House Captions, Vice- Captions & Prefects were also appointed & presented badges & sashes by house in charges. 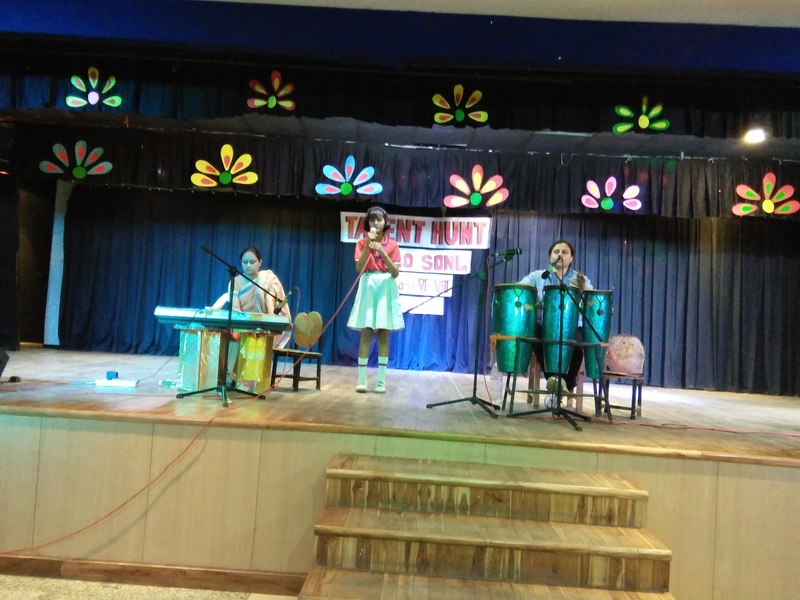 The highlights on the occasion were the excerpts from the speeches of Students and the audience re-lived ‘The Joys of School Life’ through spectacular performances by the dancing divas of the school. 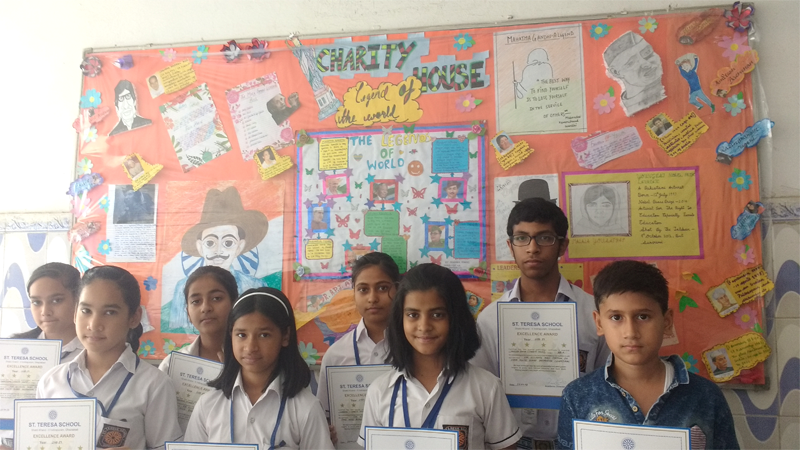 Kavish Kankran was appointed Head Boy while Maitrayi Rajawat was appointed Head Girl of School. The programme followed by a speech by Honorable Director, Mr. Raman Khanna who exhorted the young generation to rise up to contribute fully to the society, as responsible citizens.